Reep House for Sustainable Living is Reep Green Solution’s LEED® Platinum certified demonstration home and education centre. This super-insulated, water-wise century brick home is located at 20 Mill Street downtown Kitchener. Reep House has been renovated to showcase energy and water innovations that any home can adopt. Deep retrofits have reduced energy used for space heating and water heating by 86%, reduced costs by 85%, and cut carbon emissions by 54%*. You can visit Reep House at one of our many open houses. We also offer tours for larger groups including for students. Come to Reep House to see an array of green technologies in action. Learn about how you can make your home more comfortable and energy efficient. Launched in 1998 by Natural Resource Canada’s Office of Energy Efficiency, the EnerGuide for Homes service encourages energy-saving renovations by providing homeowners with a comprehensive audit that determines their household energy consumption and losses, and a list of retrofit recommendations that will generate savings. The EnerGuide rating indicates the home’s current level of energy efficiency compared to houses in our region and across Canada, and gives a potential rating after retrofitting. Reep House achieved a final rating of 87 on the EnerGuide scale, outperforming most modern homes. Prior to the retrofits, the house was rated at a 49, which is typical of unimproved houses of this type and age. 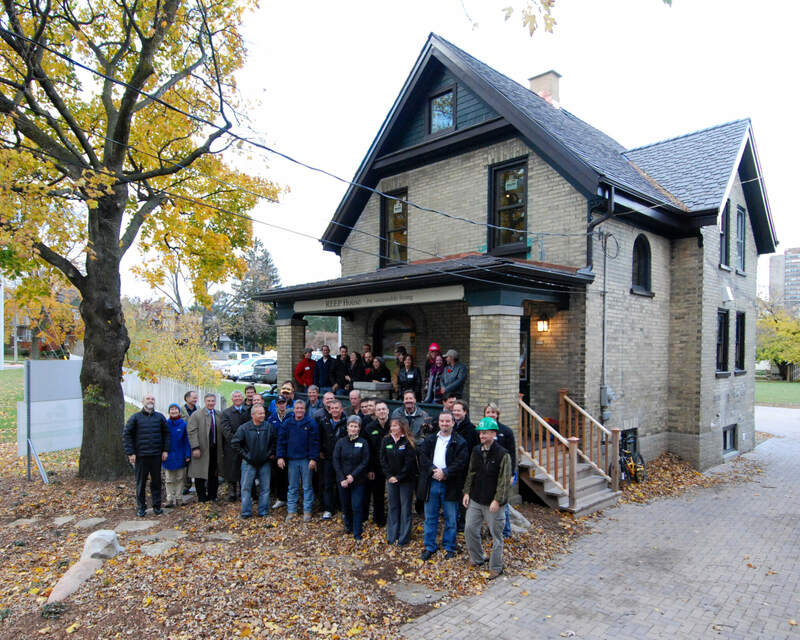 Reep House is a community project with local partner participation, engagement and generous donations from local contractors and suppliers, as well as funding from foundations and local, provincial and national government.